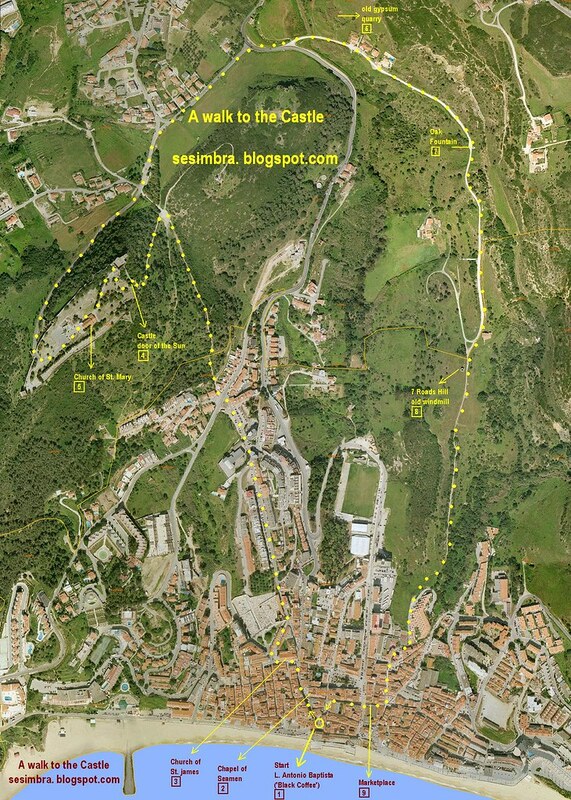 This is a guide for a short walk of 5 km to the castle and the hills around Sesimbra. I have seen people walking to the castle on the main road, but this is dangerous, as in some places there is no sidewalk. The path I propose is very calm and the landscapes are beautiful, and includes a circuit on the hills surrounding Sesimbra, a zone sometimes called the "Shell of Sesimbra". Click on the image on the right to get a map of the walk. If you want a bigger version, I can send it to you by email. 1 - Let's start at square António Baptista, near the Fortress of Santiago (St. James). You can find several coffee houses nearby, but 'Black Coffee', exactly in this square, is a good meeting point, and also good to eat something, get some water, etc. (no commercial intent in this suggestion; this coffee is closed on Sundays). 2 - Walk up street Cândido dos Reis. Some meters ahead, you can visit the Chapel of the Holy Spirit of Seamen, now a museum, and also the ruins of the medieval hospital. 3 - Some steps ahead there is the Church of Santiago (St. James) from the 16th century, in the transition between 'manuelino' (Portuguese gothic) and renaissance styles. 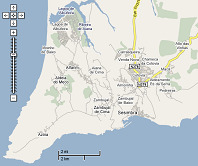 It is the main church of Sesimbra. Recently an old lateral door was unveiled on the sowth wall, under the exterior plaster: take a look! Continue in the street João de Deus, where some neighbours grow flowers at their doors. Now, take the street Ramada Curto. At the end of this road you leave asphalt and begin walking among natural plants. These hills were, long time ago, intensively cultivated, but not anymore; so you may find here some domesticated trees that have returned to the wilderness: olive trees, sweet almond trees. 4 - We enter the Castle by the main door, also called the Sun Door. This National Monument has many interesting points, I just point out the 'Alcáçova', (main tower to the left, after the Sun Door) and yhe Church of St. Mary, with beautiful tiles. In the Castle there is also a tourism office. 5 - The church of St. Mary of the Castle. The first church was built at this place in 1165. The present church was rebuilt in 1721. 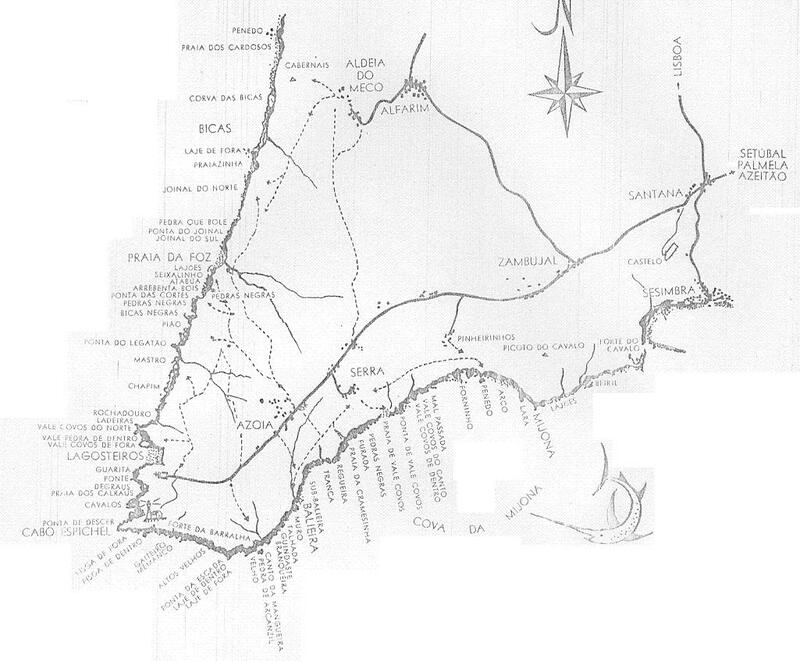 If you don't want to walk much more, you can get back to Sesimbra by the same road. If you choose to go on, leave the Castle by the north-west Door of Azoia, or by the nearby opening made in the walls for the cars; now, you begin descending. At one point you are going to cross national road: take care with cars. You'll take then Estrada da Fonte Carvalho (Oak Fountain Road), a sandy road. 6 - Just as this road begins, there is an old gypsum quarry to the left, where you can find some gypsum stones. It has no commercial value, take some with you as a souvenir. 7 - Further on, you'll find Oak Fountain, once known by its medicinal properties. Now it is forbidden to drink this water, due to poluition, but you can use it for cleaning and refreshing. 8 - Next point of interest is the Hill of the Seven Roads, with an old windmill in ruins (walls only). At this point, you have a beautiful view of Sesimbra, the harbour, and the valley. Now the descent becomes steeper, through a road with signs of ancient (but now finished) agricultural activity: stone walls, agave trees, fig trees. Already back in town, you'll get to Largo do Municipio, with the Town Hall at your left, and the 'Pelourinho' at the center: a medieval stone monument (now a replica) granting the municipal statute of Sesimbra, given the king at 1201. 9 - Take now the Street of Republica, where you can visit the market place, with vegetables, fruits, fresh cheese, and bread from the rural region of Sesimbra. There is also a fishmarket with very good fish. Take again the street of Republica, once the main street of Sesimbra, hence its old name of Rua Direita (Straight Street). And you'll get back to António Baptista square. I hope you enjoy the walk! É pá! Este inglês é obra! Beau travail pour faire connaître votre région. Good work for the benefits of the tourists. Thanks so much for posting this. I visited Sesimbra in April and was very disappointed that there are so few walking/hiking routes in the area marked up for tourists. 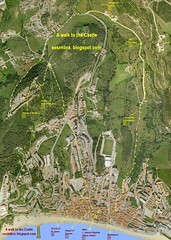 I enjoyed this walk very much, and I find it displays a lot of the hills and nature surrounding the village. Great job! Nesta terra tudo se sabe. Não se pode falar no Calvário que não se oiça logo na Fonte Nova. 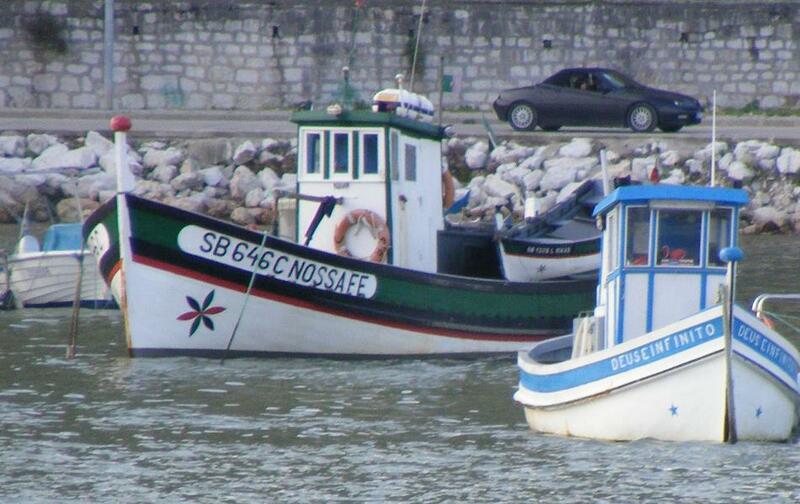 "Este Mar que nos pertence"
Os homens do mar de Sesimbra são sábios. Sempre souberam transmitir o seu conhecimento aos aprendizes atentos, aos capazes, como escreveu Álvaro Ribeiro, de aceitar a audiência antes da evidência. Grau a grau, ou degrau a degrau, se ascende de moço a arrais, passando por companheiro. Quem nasceu aqui foi o barco. Se as fotografias não são suficientemente boas, é porque não se está suficientemente perto. Barra lateral em reconstrução após ataque de virus. Pedimos desculpa por algum eventual lapso.